This seems to be the only thread about these clips. I have some follow up questions, what are these clips doing in the engine. I reassembled the head without them, I only saw fragments of them when disassembling. I was planning on installing the head today, What should I do now? i sure don't know that,but I can tell you on this cheap car, not one part is extra or useless. my wild guesses are this. 1: they keep those follower devices from rattling. some 4x4 shops stock them at x2 retail off the suzuki parts pages actual. springs broken up and lost inside any engine is nasty thing, wow. seen every time at the 50k mile service point,saw one, that was cracked but not fell out once. off topic but related big time. do this yet, in the fsm book or leaks oil out rear bad. 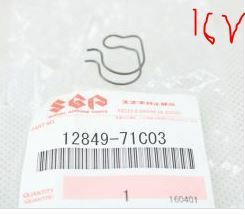 hard to find parts titled head springs. see it and see pn. if i google search that pn , it shows, me BINGO it.